The Railway Addon Mod, commonly abbreviated RAM, is a transport-related modification that was developed as a plugin to the Network Addon Mod (NAM). The RAM Team's purpose in developing the mod was to create custom content that serves to make railways as versatile as possible in SimCity 4. The team was started on the SimCity 4 Devotion (SC4D) forums in February, 2008, by David (dedgren), who had developed rail wide radius curves previously for the NAM, and was then in the process of creating the initial Fractional Angle Railroad (FARR) puzzle pieces. David solicited members for the team, but its growth was slow at first. In early September, 2008, SC4D members Jonathan (Warrior) and Dave (Bighead99) literally came out of nowhere with the first pieces of the Single Track Rail (STR) project. 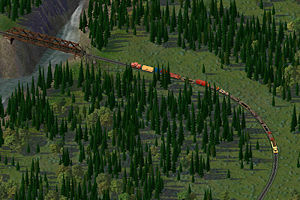 STR, as its name implies, is designed to provide the SC4 player with the ability to have a single rail line as opposed to the standard game default double track. Jonathan, who is an experienced transit modder, began creating draggable sections and puzzle pieces to make up the basic set. Dave took on the mammoth task of duplicating all of the game's double track textures in STR. Work on the STR was quickly joined by David (Dedgren), Dirk (North Country Dude) and Matt (threestooges). David developed textures for wide radius STR curves and for various switches and later took over Jonathan in modding the puzzle pieces, to allow Jonathan to work full time on the draggable content. Dirk, who has been a longtime member of the SC4 railfan section of the community, primarily at Simtropolis, brought to the team his work on railyards and various switches and specialty tracks. Matt Threestooges expanded his ongoing work on rail bridges to create the first STR bridges, including a trestle, plate girder and a Howe truss bridge. In November, 2008, Dave, assisted by SFBT transit modder and later RAM Team member Andre (ArkenbergeJoe), began work on STR viaducts to match the ones he created for game rail lines. Longtime SC4 railfan Bernhard (Nardo69) also joined the team, and contributed his vast knowledge of RL railroading in assisting with the STR and other projects. Jan (Swamper77) did the Type21 exemplar work for the team, which allows signals, crossing gates and other detailing to be incorporated in the various projects. The initial STR set includes basic straight and diagonal draggable sections, ploppable wide radius curves and switches, level crossings with other networks and a selection of bridges (available separately). It was released as a NAM plugin on March 7, 2009. Given that all RAM Team members after the first release were NAM Team members, the RAM Team existed as an subsidiary of the NAM Team for much of its existence, an arrangement that was eventually made formal. When the separate component plugin paradigm was abolished for NAM 31, in March 2013, the RAM and its bridges were merged into the NAM itself. Future plans of the RAM team were to include the development of Triple and/or Quad Track Rail (three or four tracks on one tile), expansions of the double track wide curve, switch and FARR set, and additions to the STR. However, due to the main development staff for the RAM going on indefinite hiatus, so did the project. With the development of the RealRailway (RRW) project by Swordmaster in 2013, the NAM Team made the decision to discontinue the RAM as it existed. Many RAM concepts will be subsumed under the RRW concept. The support thread that this article is about can be found [http here] on SC4D. This page was last modified on 20 June 2013, at 19:35. This page has been accessed 58,464 times.